I guess I could have taken some photos of the AQM set up day yesterday, but to be honest we are usually so busy that the camera is the last thing on our mind. Set up of our stand finally done. This year we printed chair backs! I always think that setting up a display stand is a bit like getting dressed to go to a formal function: the fashion gurus always tell you that “less is best”, they recommend that you look in the mirror before you leave the house and take off one piece of bling. 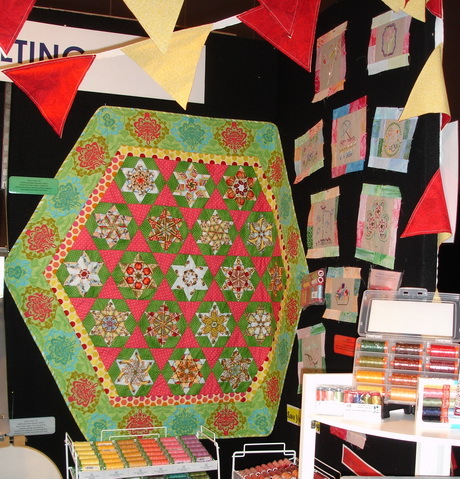 We always try to have lots of examples of how Aurifil can be used for patchwork, quilting and embroidery, such as judysew4th’s bathing beauties hexagon quilt. 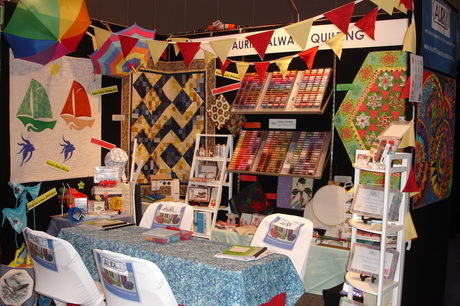 It doesn’t matter how often we set up a stand for a quilt event, we always start out with a plan and it is completely different by the time we have finished the set up. This time we set up the display, based on our original plan, then went off for a cup of coffee. When we came back we were able to re-arrange things with “fresh eyes’. In fact I think we tweaked & re-arranged several times but somethings, like our side wall above, were perfect the first time they were set up. 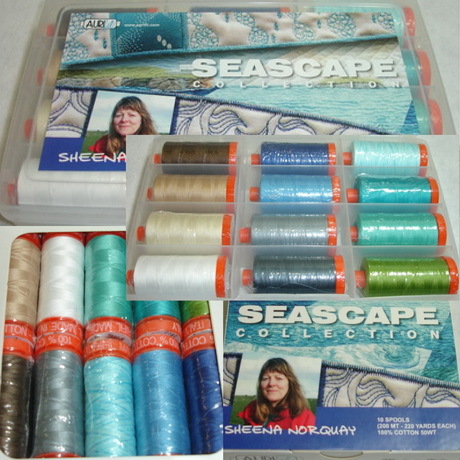 This year we started with a summer beachside theme, suggested by judysew4th and confirmed when we received Sheena Norquay’s beautiful Seascape kit Art boxes. Today, the first day, was very successful. 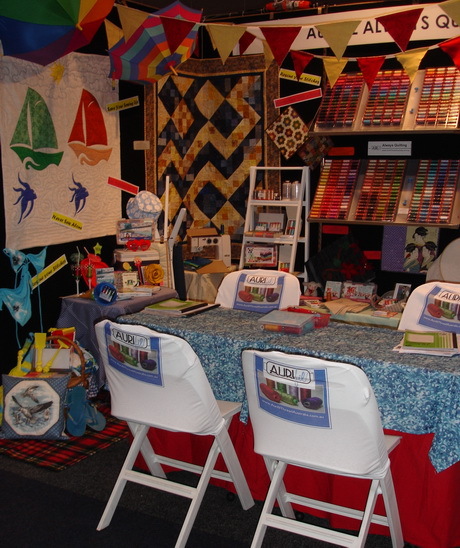 Quilt Market is always a great opportunity to catch up with old friends, and to meet people who we may only know via telephone or email. 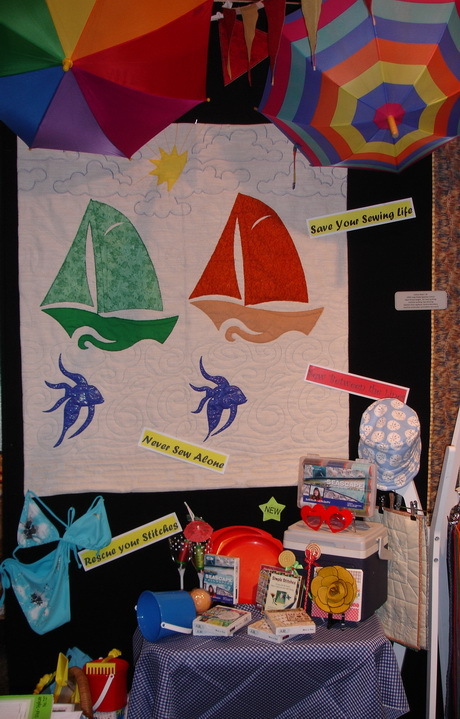 I quilted an ocean scene to use as a backdrop. AQM is held over two days in Melbourne so, today, half way through the event it truly is a half glass full with more fun still to be enjoyed. 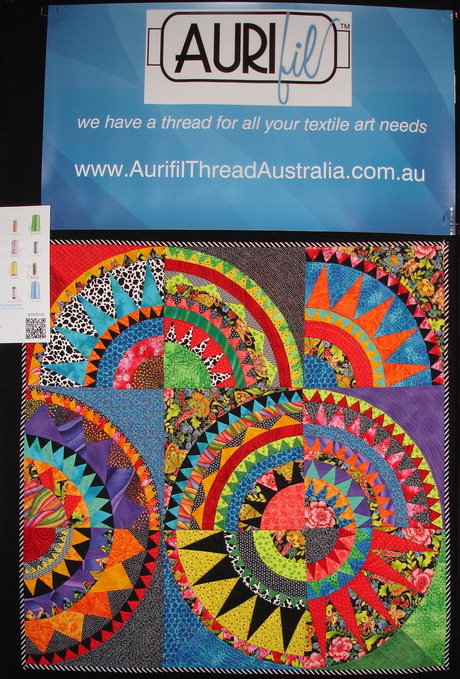 This entry was posted in Aurifil, Cotton Mako', Events, Home page, Shop Snippets and tagged Always Quilting, Aurifil, Australia, Cotton Mako', Melbourne, Textile Events. Bookmark the permalink. ← Tuesday Treats: Not all hand stitched gifts have to be quilts. I like your beautiful stand and your works! 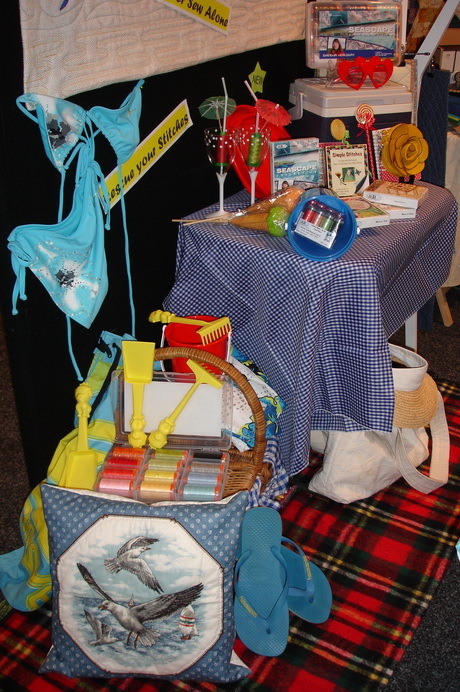 Thank you Anna Maria, we certainly had fun planning and setting up the display.